This oceanfront Maui hotel resort property features an oceanfront pool right on water's edge. The Royal Mauian is adjacent to beautiful beaches Kamaole 1 and 2. Sandy beaches, great snorkeling, shopping, and dining are all at your fingertips when you stay at the Royal Mauian. This property is distinguished for its rooftop barbecue as well! Incredible 360 degree views from the top of our building that will likely take your breath away. Have you ever dreamed of grilling in paradise? Come make your dream a reality with the best view from a barbecue area you have had to date! With views like this, it is no wonder why Royal Mauian is one of the most popular hotel resort properties on the best Hawaiian island. Maui No Ka Oi! Making the journey to the world's most remote chain of Islands is an arduous one but when you arrive you will see what makes Hawaii so special. Make the journey to our gorgeous isle worthwhile when you stay at the Royal Mauian. 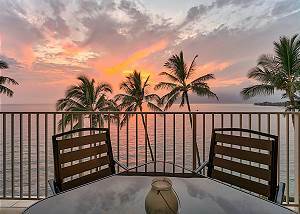 Greet the day eating breakfast on your condo rentals oceanfront private lanai! Barbecue with family and friends on the roof taking in the views of Haleakala and the Pacific Ocean. Let the Royal Mauian be your Hawaiian getaway! Manicured lawns, tropical landscaping, and the fragrant flowers at the Royal Mauian will transport you straight into vacation mode. Live like Hawaiian royalty when you choose the Royal Mauian for your Hawaii vacation rental accommodations!